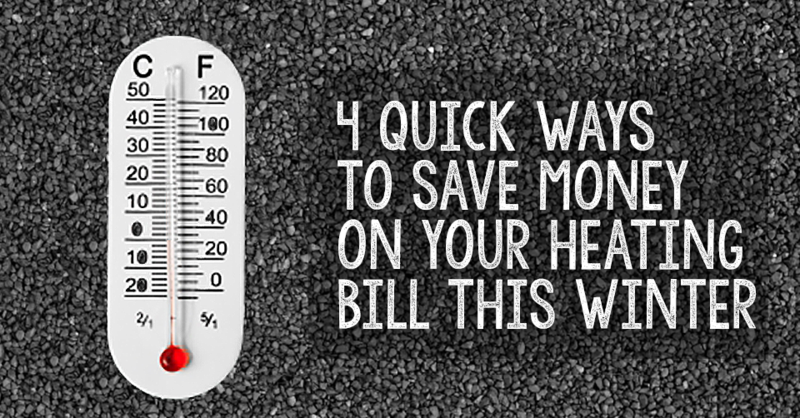 With the weather being so cold, your heating bills are firing up. So how do you keep those heating bills under control and still stay comfortable? Read on to learn four easy ways to save money on heating bills this time of year! 1. Turn down the thermostat… but not too much. The first and most obvious way is to turn down the thermostat. However, turning it way down at night and way up during the day only makes the furnace work longer. According to the US Department of Energy, you can save up to 1% off your energy bill for every degree you set you thermostat back in the winter. However, it is recommended to use a programmable thermostat to maintain optimum comfort and avoid long periods of warm up for the furnace. 2. Close off un-used rooms. If you have spare bedrooms that are not used, close the heat vents and doors. This will allow the heat in the vents to be diverted to the rest of the house, thus heating the rest of the house quicker and more efficiently. 3. Use bathroom vent fans sparingly. When the vent fans in a bathroom or kitchen are used to vent air to the outside, they not only carry the steamy moist air out, they also carry out the heat. Most of these fans are located in the ceiling where most of the heat resides. 4. Adjust your window blinds. Keep blinds closed especially at night and open during the day. Blinds help by deflecting cold air from circulating around the room. Drapes are a good way to keep the heat in during the winter while adding an aesthetically pleasing look to the room. By taking a few simple actions this winter, you can stay warm and comfortable without breaking the bank! What are ways that you cut down on your energy bill during these cold months? Share with us in the comments! This entry was posted in Apartment Living and tagged tips. Bookmark the permalink.